14 Best Aquascaping Fish - Perfect schooling fish. Blog 14 Best Aquascaping Fish - Perfect schooling fish. If you have a planted or aquascaped aquarium and you’re looking for the Best Aquascaping Fish that will school in large groups which will show of your aquarium, then look no further than the ones below. Lets first start by answering some questions we get asked about this topic all the time. The question we get asked the most is…..
Well, the main difference between the two is that shoaling fish are fish that stick together for a purpose like feeding, breeding and are not always the same type of fish or even species. Schooling fish, on the other hand, tend to be fish of the same species. This is really all down to semantics, but generally schooling fish only school with their own type whereas shoaling fish can be all different species of fish all swimming together for a set purpose like safety in numbers and easier to find food. Schooling fish tend to have what we would call ‘ passive markers ‘ that can be a spot or a stripe on their body or even a particular shape on their fin. They use these as a guide to school in large numbers. The general rule with schooling fish is, the more you have the more they will school and the better the overall appearance. The second question we get asked a lot is…. The answer is no, some species will simply not school in the true meaning. They may still swim together in large groups with as mentioned before this is often different species and all are swimming in a group for a reason, not for the sake of schooling. Another cool fact about both schooling fish and shoaling fish is that they often isolate and push out any sick or diseased fish from the group to protect the group. Any fish of the same species you see that is not part of the group should be quarantined quickly as it’s a sign that something is wrong. If you have several species of schooling fish in the same tank they will stick with their own kind and all swim in a similar direction and all have the same focus. Whereas several different shoaling fish will all stick around each other but with no real focus and direction. The rule of thumb is to have as many schooling fish in one aquarium as you can safely keep. You will get a much more natural behavior if you keep them in large numbers, the overall effect will also be enhanced. So, now you know the difference, let’s take a look at the Best Aquascaping Fish. The perfect fish to school in large numbers and make you aquascaped or well-planted aquarium stand out and look its best. The Cardinal Tetra is perhaps the most popular of all of the Tetra fish. What’s unique about the fish is the remarkable coloring and pattern on its body. A neon blue stripe that runs across its entire body is demarcated with a bright red one. The fins and tail are transparent. This distinct coloring makes it perfect for aquascaping. However, if you wish to enhance the brightness of the vivid colors, you should ensure that the tank contains soft and slightly acidic water. These fish are a peaceful variety of tetra and are best kept in large schools. These large schools not only enhance the beauty of the fish but keeps them happy as well. You can keep them with all kinds of small and medium-sized community fish, however, avoid putting them with fish that are known to eat smaller fish as their bright color is very tempting for larger fish. Also, keep in mind that these fish are not intended for the newly started aquarium. So, you should only keep them after the tank has achieved stable water chemistry they are not as tough as its similar counterpart the neon tetra. When it comes to aquascaping, the correct lighting and décor is very important. These fish are already so vivid in their colors, they do not need too much light to show off their colors. Live floating plants will help control the lighting even further. Also, they need hiding spaces so ensure you have plenty. Harlequins or more commonly known as the Harlequin Rasbora is a unique and eye-catching fish, perfect for well planted or aquascaped aquariums in large schools. Its metallic red colors and the vivid patterns are sure to make your aquarium brighter. When kept in shoals of 15-20 fish, they can add vibrancy to your aquarium and enhance the backdrop and aquascape scene. Their red and orange colors are in stark contrast with the cool blue aquascape as well as the dense, green aquatic vegetation and rocks. Not only are they immensely attractive, but they are easy to keep as well. They are peaceful with other fish, so you don’t have to worry about any quarreling. However, we do recommend that you keep them with smaller fish. The bright and beautiful colors might attract the bigger fish a little too much. As a result, your beautiful school of Harlequins may be in danger of getting eaten. Furthermore, they are freshwater fish so the ideal condition for them is soft water that is slightly acidic. They are native to Malaysia, Singapore, Sumatra, and southern Thailand. They inhabit streams and waters that have large amounts of decaying leaf matter which makes the waters acidic. Also, they enjoy dense vegetation as it gives them a chance to hide out when they are feeling too stressed. Live plants along with an open area for swimming are the perfect habitat for these fish. In addition, the live plants further add to the beauty of the red Rasboras. The fish are natural schooling fish and will follow each other in regiment formation around the aquarium making them the perfect fish for aquascape aquariums. 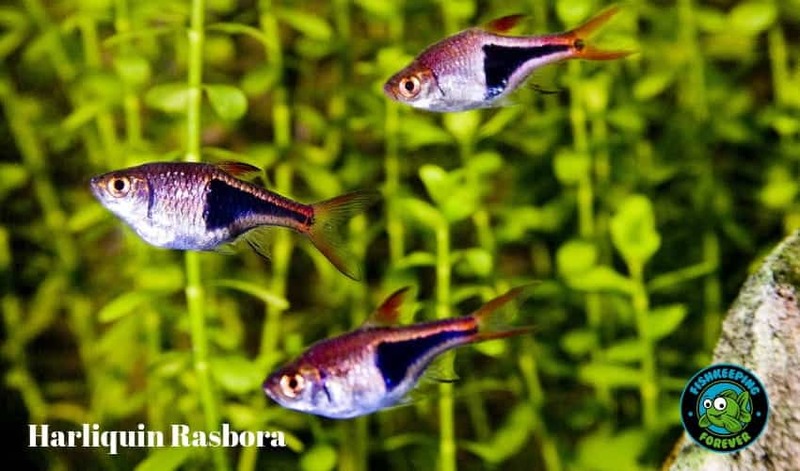 There are many species of Rasbora but we feel this one is easy to obtain in large numbers, low cost and easy to care for. Hence the reason they made it onto our 14 Best aquascape fish list. 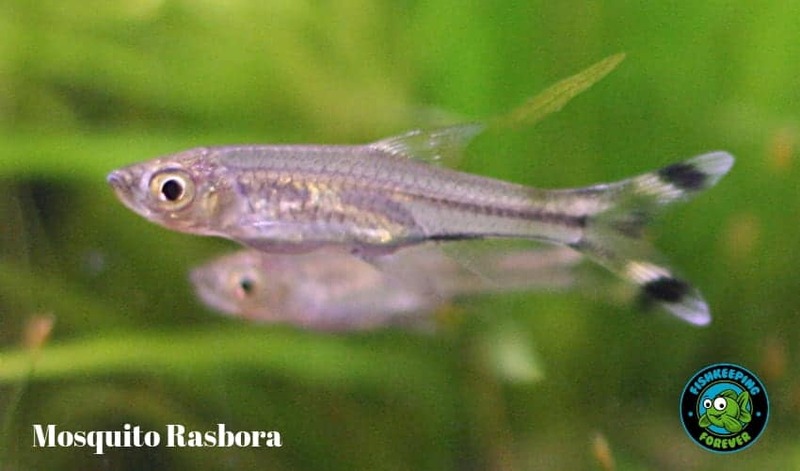 If you’re looking for very small fish, then the Mosquito Rasbora might suit you well. Often measuring less than 1 inch, their bright red and grey colors add a sense of sophistication and beauty to your well-planted aquarium. However, don’t be fooled! Just because they are small, doesn’t mean you can keep them in small tanks. In fact, the Mosquito Rasboras thrive in larger tanks of 20-30 gallons plus. We recommend going with an even larger tank where they can swim freely in large schools. Not only do these fish enjoy the large space, but it will make them more visible to you and would make a fantastic school of around 20-30 fish. 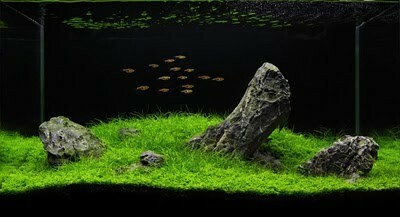 Furthermore, if you intend to aquascape with them, ensure that you know all the ideal water conditions for them. This includes extremely dense vegetation that helps them hide from predators and hunt for food. The live vegetation will further add to the beauty of your aquarium due to the contrasting green and red colors. They will not eat your plants which makes them perfect for aquascaped aquariums. However, one major drawback is the availability. 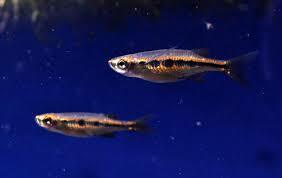 They are harder to obtain so, you might find that these are higher priced than other Rasbora fish. Furthermore, they are a schooling fish which means you need to obtain at least 15 of them. The cons aside, the beautiful trailing effect of this school of fish is unbeatable. 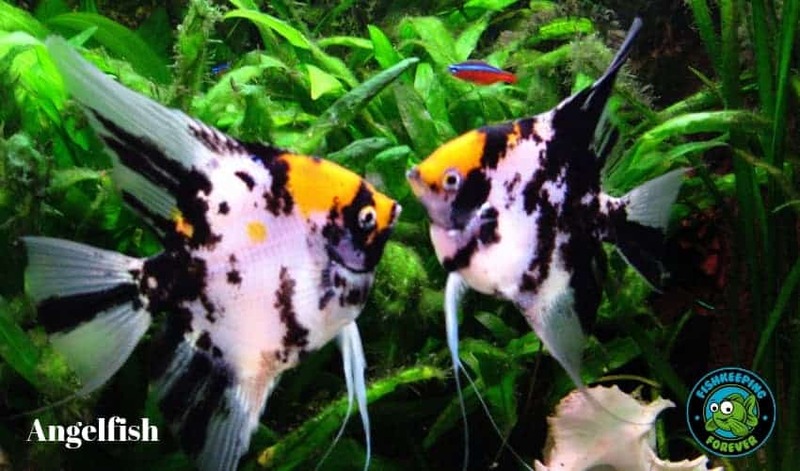 Another cherished freshwater fish by most aquarium hobbyists is the Angelfish. It is a stunning yet graceful fish. While it may not be equipped with the same bright colors as other aquascaping fish, it still holds its own due to its elegant swimming behavior. Mostly, you’ll find them in captivity and hence many colors are available. However, the most common is silver with black stripes. Also available are varieties with long fins called the ‘Veiltail Angelfish’. With their longer fins sashaying in the cool, blue water, they add an eye-catching sight to any aquarium. On the other hand, you need to pay special attention to their care and maintenance. These are more sensitive than other fish, especially when it comes to water quality. You’ll be better off with slightly warm water and a neutral to slightly alkaline pH. You can add a CO2 setup to ensure favorable conditions for both the fish and plants. In addition, they grow to be quite large in size, so you should go with a 55-gallon aquarium. Generally, we recommend taller aquariums due to their tall heights. For the vegetation, we recommend a few floating plants as well as few driftwoods to provide them with cover and shelter. All in all, they may be a challenge to monitor and maintain, but the Angelfish is definitely the most elegant choice you can have. For a schooling fish, these look incredible when smaller. However, you need to remember these fish grow to around 8″ in size and therefore need a very large aquascaped aquarium if you’re going to keep them in a large school. 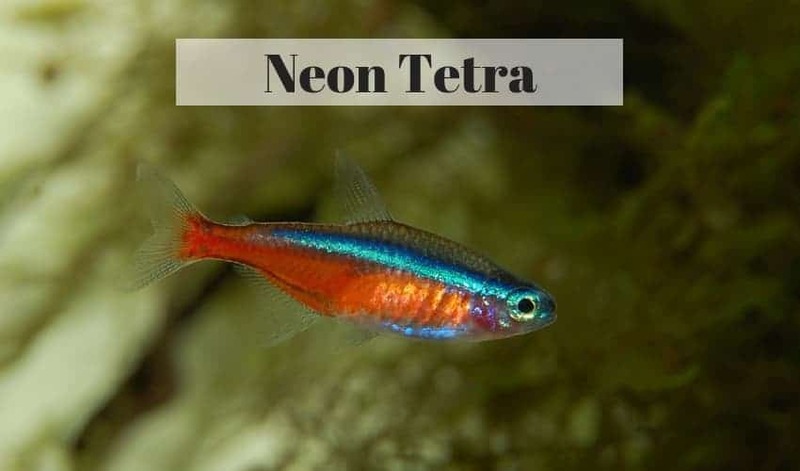 The Neon Tetra is perhaps one of the most popular species amongst fish keepers due to the attractive colors and the ease-of-care. They are the number one selling tropical fish in the world and come a close second to the most sold fish in the world which is the humble goldfish. In fact, it is perfect for beginners who are just starting on aquascaping. A turquoise stripe snaking from their eyes to their fin, only to be broken by a red lining, provides the perfect sensationalism for any aquascape. The effect is amplified when a school of these fish swims together. 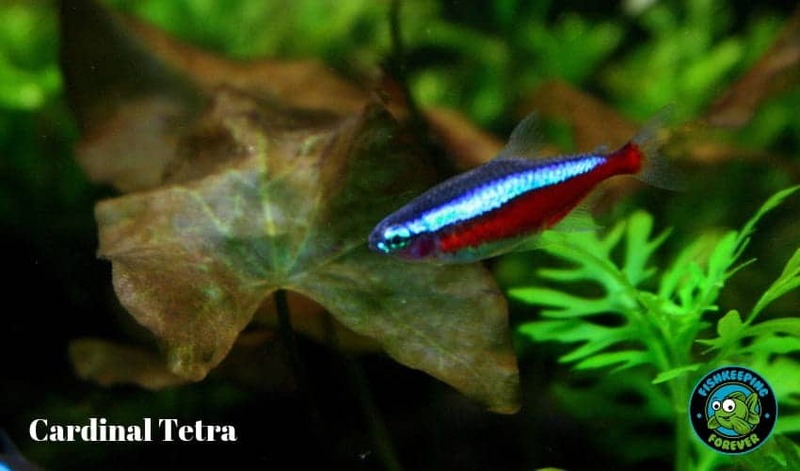 The average size of the Neon Tetra is 1-1.5 inches. So, you can keep them in a smaller tank of about 10 to 20 gallons, but to get the best from these stunning little fish is to keep them in a well-planted aquarium of around 50-60 Gallons and in a school of around 30 fish. Also, the best part is that they are easily available at any pet store. Thus, you can find them in bulk at an affordable price. You can use the money you save on dense vegetation and lots of plants since these fish are more comfortable with greenery. The only point you need to take care of is not to put them in new tanks, they are hardier than their counterpart the cardinal tetra but still not suitable for a brand new aquarium. They survive much better in mature tanks as their bodies are sensitive to the changes in water quality. Generally, slightly warm and acidic, soft water is best for them. Also, they are a community fish that thrive with other smaller fish. All in all, the Neon Tetra is the perfect budget solution to buying aquascaping fish in bulk. The iridescent Black Neon Tetra is an extremely energetic fish that looks stunning against a darker background and dense green vegetation. Their vivid colors are only dulled by their vibrant and easy-going personalities. Their silvery iridescent stripes are in heavy contrast with the velvety black neon stripe beneath it. They grow to be about 1 inch in size. As a result, you can keep them with other smaller tropical community fish like Tetras and Rasboras. Since they are community fish, they thrive peacefully with other members of their species. Generally, we recommend a school of 6-12 fish in a 10-20 gallon tank. However, avoid keeping them with larger predatory fish or other aggressive fish. Larger fish might eat or nip at the Neon Tetras at the first opportunity they get. When it comes to caring, the Black Neon Tetras are quite easy-going. Although they prefer soft and acidic water, they can still easy tolerate hard or neutral water. Live plants and subdued lighting is bound to bring out the best of their colors. Also, remember to leave a large area for open for them to swim. They are very avid swimmers so we recommend going for a tank that is larger in the horizontal direction. 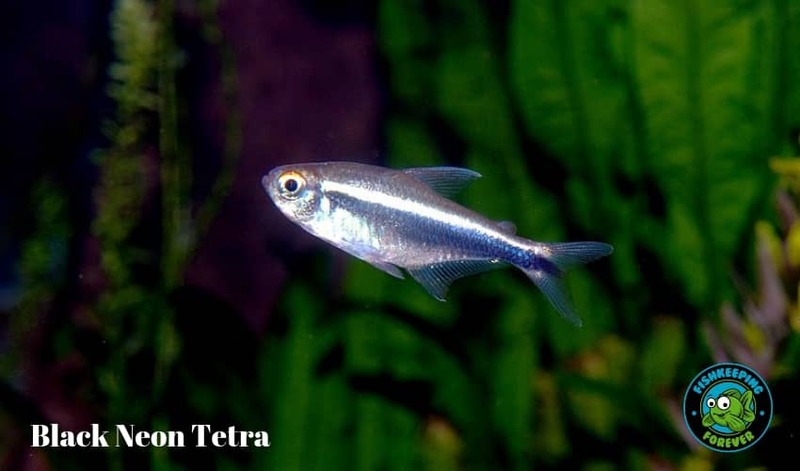 Overall, the Black Neon Tetra is an exceptional fish that will elevate the look of your aquarium tenfold. One of the best-aquascaped aquariums I have ever seen was in Belgium it was a 100 gallon aquascaped open top aquarium with a school of around 60 Black neon tetras and it looked stunning. The best part is that you can keep all of the different breeds together in the same school and even interbreed them. The widely differing colors and patterns will surely grant a unique look to your aquascape. However, many aquarium hobbyists refrain from Discus as they might be a little challenging to look after. On the contrary, they only require the most basic water quality and they’ll thrive. In fact, these fish prefer soft and slightly acidic water, which means you won’t even need a CO2 filter. 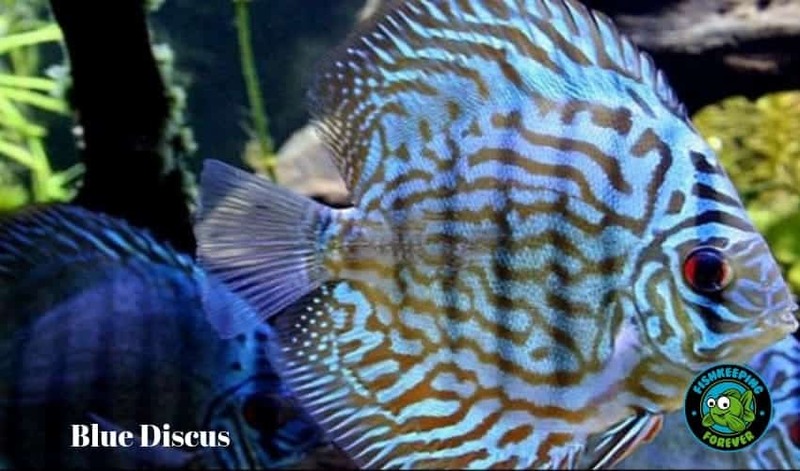 The most important part about keeping Discus fish is to conduct regular water changes and provide them with a variety in their diet. Also, they are quite large fish, so we don’t recommend them for smaller aquascapes. As you’ll be keeping them in a school, a minimum of 75-gallon tank is a must. However, the larger tank also allows you to keep them in a school of around 6-10. They can be an excellent addition to any tank, provided the tank is big enough for them, they look cute at 2″ but remember they will grow large. Whether you’re a beginner or a more experienced aquarist, the Cherry Barb, with its bright colors, is bound to catch your eye. Its schooling and tolerant nature make it perfect for aquascaping. 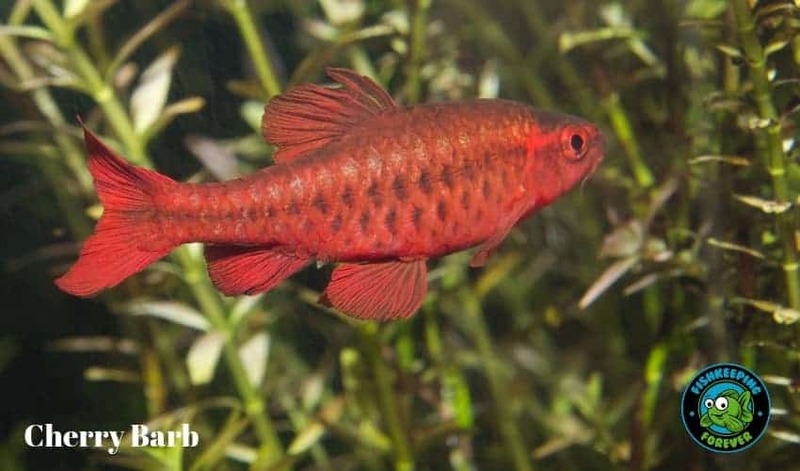 The Cherry Barb is a beautiful cherry red color, with females being a little lighter than the males. As a result, most folks gravitate towards buying the males, however, the absence of the females can result in an unstable environment. Regardless of gender, they will add a splash of color in your green and blue aquascape. Another remarkable tendency is that they like to move and swim a lot. This tends to create eye-catching movements at all times of the day schooling from left to right in a regimental pattern. It is imperative that these fish feel at home. So, you need to ensure a dense plantation with lots of green plants. Also, since they can reach 2 inches in size, it is important that their tank is at least 25 gallons, if not bigger. Ensure that the lighting is subdued and that the plants provide plenty of shade. Apart from that, you don’t need to be too fussy about the water quality. They are generally tolerant of slight variations. The Cherry Barb are a bunch of hardy fish that will make great additions to your aquarium. The availability of these fish is good and the low is relatively low so they make an affordable schooling fish. 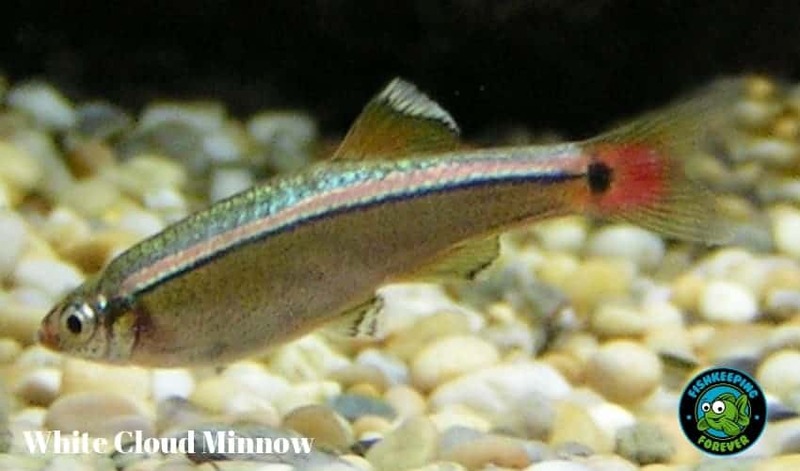 If you liked the Cardinal Tetras but were put off by their prices, then the White Cloud Mountain Minnow is an easy and affordable replacement. They usually grow up to 1.5 inches and are distinguished by the neon turquoise stripe. Their body is a shimmering brown color ending with a stunning red transition. However, there are other variants such as golden or long finned ones available at most stores. These fish show dimorphism as well, with males being more slender and colorful. Moreover, they are quite peaceful and fit well with other peaceful species. If you keep them in schools of six or more, they will be happier. Furthermore, they prefer cooler water, making them perfect companions for Goldfish. However, be wary of keeping it with Goldfish that are too big as they can eat them. They are quite undemanding when it comes to water quality. You don’t need to take any special care about the hardness and pH of the water, however, ensure that the water isn’t extremely hard or soft or acidic. Also, avoid keeping them with bigger fish as they might eat them. All in all, the White Cloud Minnow is a great option for those looking for a neon fish under a budget. They look amazing is a large aquascape aquarium in a school of around 20-30 fish. 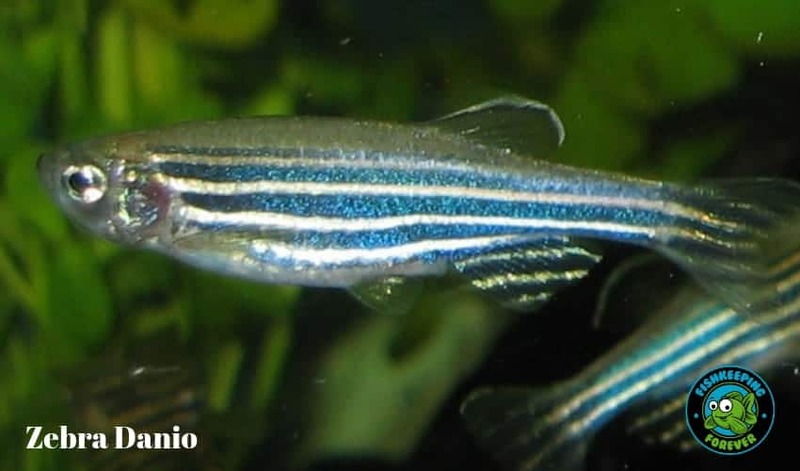 A rather unique fish, the Zebra Danio remains a cult-favorite amongst hobbyists and fish keepers. Why? Their ease of care and easy breeding along with the attractive patterns make them a staple for any aquarium beginner. Their distinct blue and purple zebra pattern makes them stand out more than any other fish. Since they are active swimmers, they are always out and about granting your aquascape a unique look 24/7. There are other varieties such as Golden, Veiltail, long finned Zebra Danios as well. All of them are quite small in size, about 2.5 inches. This makes them suitable for community tanks and aquariums. Also, they are quite peaceful except with a few species such as the Guppies, Angelfish etc. Moreover, they are quite hardy as they can easily withstand a wide variety of water temperatures. Mostly, they prefer cold water with a strong current. However, if the water temperature is too low, they will likely suffer from diseases. Furthermore, they require diffused lighting and a large open space surrounded by various live plants. They are quite inexpensive to keep and require little maintenance. All in all, they are perfect for beginner aquascapers due to their extremely hardy nature. They are in my opinion a very underrated schooling fish. If you look at their colors in more detail and close up they are simply unique and stunning. 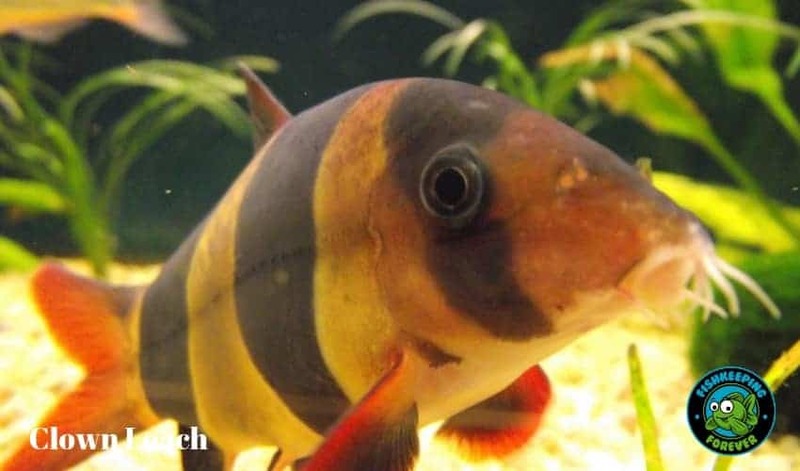 The Clown Loach is one of the most recognizable fish offering vivid colors in abundance. Combine the red fins with the orange and black striped body and you have an aquarium staple. They are unique as they have a sharp spike protruding from beneath their eye for defense purposes. So, it is imperative that you be careful in trying to handle it as the spike can easily snag in a net and hurt your hand. They prefer to live in schools and are generally peaceful with all kinds of smaller and community fish. We recommend that you keep up to 6 in the same tank for company. They can be quite active during the day, however, they are a little timid in nature. The constant activity means you require a larger tank where they can move around easily. Also, they can grow to around 15-18 inches in size making them one of the largest aquascaping fish. We recommend that you only keep them amongst large small-fish communities with a tank capacity of 100 gallons and for larger clown loach simply the biggest aquarium you can fit is advisable. In addition to this, they are shy creatures who require plenty of hiding places such as caves and plants. However, they are quite hard to care for. You need to ensure that the water is soft and extra clean. 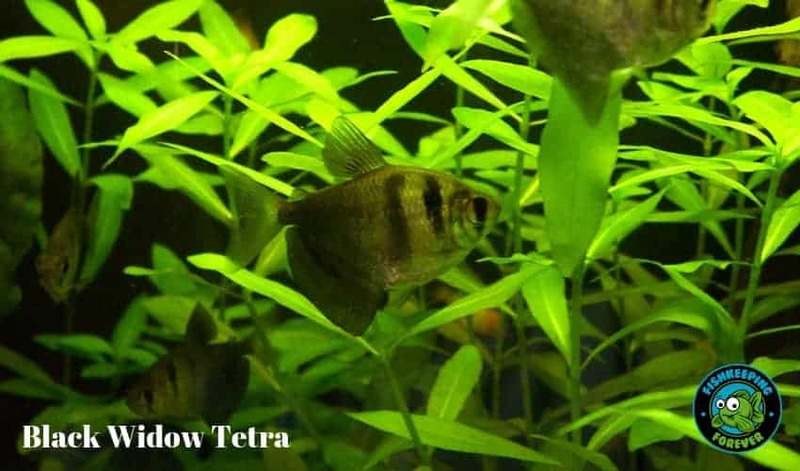 While the name may seem scary, the Black Widow Tetra is nothing but peaceful and attractive. Its gothic vibes are bound to sync with some aquarists who are tired of aquascaping with bright colors. Rest assured, its silver body and black dorsal fins are perfect for any aquarium or tank. They are also available in lighter or pinker hues if you still need a pop of color. A notable point is that these fish lighten in color as they grow up. Also, there are a few dyed varieties in the market, but we’d advise you against them as the process is quite inhumane. They are quite small in size, averagely reaching 2.5 inches at maturity. So, a tank size of 20 gallons is quite sufficient for a small school of Black Widow Tetra. Although they are quite peaceful, they do tend to be aggressive towards Angelfish or Bettas nipping at their fins. Since their natural habitat is full of plants, you should try to recreate it in the tank. Also, these fish like soft, acidic water that is warm. Ensure that the water is not too cold or your fish can fall sick. All in all, the Black Widow Tetra would be a great contrast to your already thriving aquascape. I have seen a school of 50 Black Widow tetra and I have to say it looked amazing. It was in a scene aquascaped tank of around 100 Gallons. 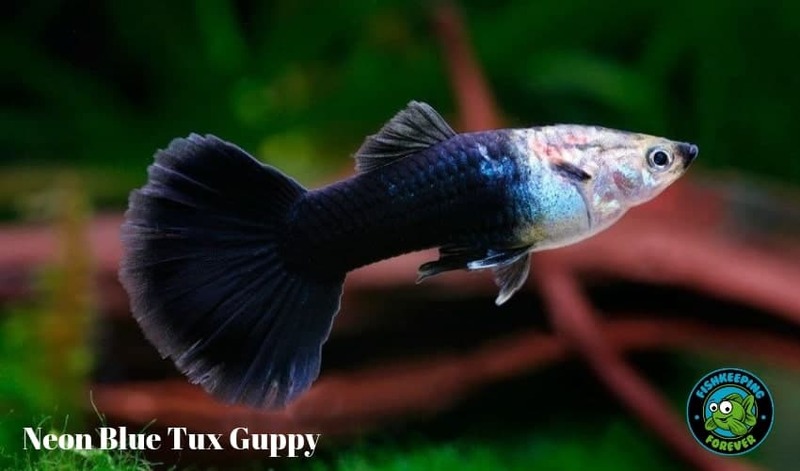 We guppy is one of the most popular aquarium community fish but is overlooked far too often as a schooling fish suitable for an aquascaped aquarium. This variety, in particular, the Neon Blue Tux Guppy is an amazing fish if kept in a school of around 20-30 fish. These fish are inexpensive and can be ordered in large quantities from your local tropical fish store or pet shop. Guppy are one of the first fish most people add to a new aquarium, but care should be taken to provide the best water conditions that they need to thrive in. 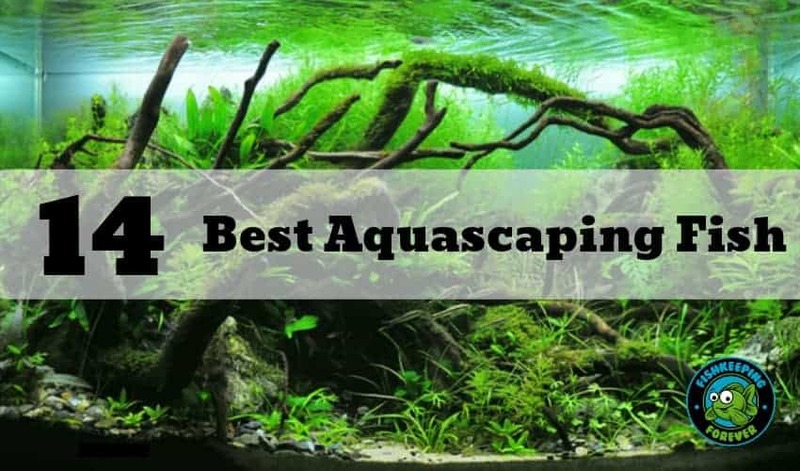 Aquascaped aquariums offer perfect water conditions is housed with bogwood, plants, and perfect water conditions which most aquascape tanks come with. Growing to around 1.5 inches they look incredible in a small school of around 12 fish. This would be a perfect size school for an aquarium of around 50 Gallons for larger schools we would recommend around 75+ Gallons. These are fish will school instinctively in groups of around 6+ fish. They follow the normal schooling fish rules and will follow the lead fish backward and forwards day and night making the most of the open water swimming space. Water Conditions pH: 6.0-7.0, dH: up to 12 degrees. The Hatchet Dadio fish is an ideal species for cooler, planted aquariums. These are naturally schooling fish which means this species must be kept in groups of at least 8 fish, and preferably many more. Ensure your aquarium is mature, fairly spacious, and incorporate a good deal of planting (both rooted and floating) in order to provide cover which helps them stay calm. In the wild, these fish inhabit sub-tropical pools and streams, so cooler than average temperatures and gentle water circulation is advised. Hatchet Dadio are expert jumpers and must only be kept in tanks with tightly fitted hoods. Dadios are sensitive to poor water quality or quick changes in water chemistry. It is therefore essential that you carry out frequent partial water changes rather than one large one. This species is not recommended for beginners. While not a picky eater, Hatchet Dadio will thrive and remain very colorful if you provide a varied diet of mostly omnivorous foods. High-quality flake food, pellets, and live, frozen, or freeze-dried Artemia, microworms, Tubifex, and finely chopped bloodworms will all be readily accepted. However, the Brilliant Hatchet Dadio requires a good amount of vegetable matter in their diet. Perfect fish in a school of around 30 fish, they will add a striking schooling pattern to any aquarium but especially larger well-planted ones. Now that you have seen some of our recommendations for a large school of fish which would be perfected for a well-planted aquarium or a perfected created aquascape, we hope you buy enough of them to create one of the most amazing and mesmerizing effects you can have in a fish tank. Depending on the size of your aquarium we would suggest around 20 of the same species as a minimum quantity to create such an effect. The list above contains 14 of the best aquascape aquarium fish but they are not the only suitable fish. There are dozens of varieties to choose from and you may not agree with the 14 that we selected. Everyone has their own opinions which fish look best in a school. We didn’t even cover bottom feeding schooling fish like a certain type of Corydoras. You can even split the tank into three sections and have a bottom feeding school, mid-level schooling fish and surface schooling fish. That would create a stunning aquarium if your tank is big enough to hold that many fish. The whole idea with an aquascaped aquarium is the look and feel of the scene you have created using plants, wood, and stone. The fish are not usually the main focal point, but they will add another dimension to any aquascaped aquarium. Read our complete beginners guide to help you make the right choices and don’t make any mistakes that beginners often do. We have a list of the TOP 30 FISHKEEPING MISTAKES BEGINNERS MAKE. It makes for very interesting reading.